Shëngjin is a coastal town in the Lezha District, northwestern Albania. Located at 41°49′N 19°36′E, Shëngjin has a population of approximately 8,000 citizens. Shëngjin is one of many cities within the District of Lezhë and is home to one of Albania’s entry ports, Port of Shëngjin. Shëngjin offers a wide arrange of environmentally friendly activities. 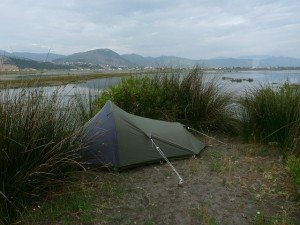 To the south of the city is a nature preserves called “Pylli me pisha dhe Lagune Kunes” and “Laguna e Vainit”, which offers a beautiful and undisturbed place to enjoy the natural surroundings of wetlands and seafront. Similarly, just north of city center is “Rana e Hedhun”, which also offers a wonderful experience of rural and undeveloped sand dunes along the coastline. Shëngjin is a growing destination site, well known for its beaches and resort accommodations. Being an ecological city, Shëngjin offers some of the best fishing grounds that ensure that there is a balance between the rate of fishing and the frequent of fishing so that to ensure that there is no too much loss of fish from the sea. Shëngjn’s economy is focused around two major industries: seaport and tourism. The Port of Shëngjin, or Shëngjin Harbor, is the northern most seaport in Albania and is frequently accessed by cargo and fishing vessels. The Port of Shëngjin provides the area with a strong industrial foundation. Shëngjin has the third largest port in Albania and the Harbor’s access point is located on the northwest part of the city. The port is protected by lengthy rock walls that extend into the sea. Shëngjin is located approximately 100 meters away from the waters of the Adriatic Sea, and below a mountain side called Rrenci that is approximately 159 meters in height. Shëngjin is also located approximately 60 km from the Tirana Mother Teresa International Airport. Being an ecological city, Shëngjin offers some of the best fishing grounds that ensure that there is a balance between the rate of fishing and the frequent of fishing so that to ensure that there is no too much loss of fish from the sea. Shëngjn’s economy is focused around two major industries: seaport and tourism. The Port of Shëngjin, or Shëngjin Harbor, is the northern most seaport in Albania and is frequently accessed by cargo and fishing vessels. The Port of Shëngjin provides the area with a strong industrial foundation. Shëngjin has the third largest port in Albania and the Harbor’s access point is located on the northwest part of the city. The port is protected by lengthy rock walls that extend into the sea. Durrësi is the secong largest city in Albania and the main destination of tourists for its large coastline. 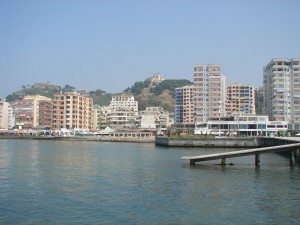 For more information on this touristic city, you may search in this page for further informations about Durrës county. Durrës is an important link to Western Europe due to its port and its proximity to the Italian port cities, notably Bari, to which daily ferries run. As well as the dockyard, it also possesses an important shipyard and manufacturing industries, notably producing leather, plastic and tobacco products. The southern coastal stretch is renowned for its traditional mass beach tourism having experienced uncontrolled urban development. The city’s beaches are also a popular destination for many foreign and local tourists, with an estimated 800,000 tourists visiting annually. Many Albanians from Tirana and elsewhere spend their summer vacations on the beaches of Durrës. In 2012, new water sanitation systems are being installed to completely eliminate sea water pollution. In contrast, the northern coastal stretch is mostly unspoiled and set to become an elite tourism destination as a number of beach resorts are being built since 2009. Neighboring districts are known for the production of good wine and a variety of foodstuffs. 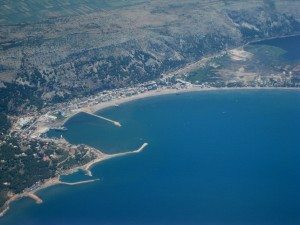 Albanian Riviera is a coastal area in the County of Vlorë running along the Ionian Sea under the Ceraunian Mountains in Southern Albania. 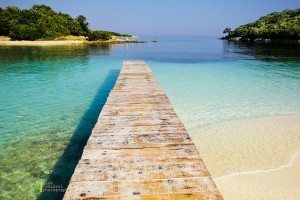 It should not be confused with the Albanian coastline as a whole which includes both the Riviera and the mostly flat coastline of central and north Albania. 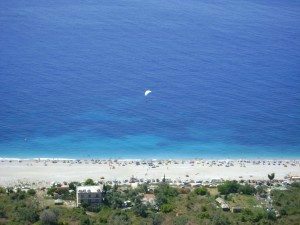 Traditionally, the region begins south of Llogara National Park, continues down along the coast through the villages of Borsh, Himara, Qeparo, Piqeras, and ends at Lukovë.The Albanian Riviera was proclaimed as the 2012 Top Value Destination by Frommer’s. Accommodation consists mainly of guest houses or BED AND BREAKFASTS and wood cabin complexes. There are a few camping areas, beach clubs and resorts while the rest of the coast is mostly unspoiled. Some owners of these facilities organize tours along the coast and the nearby area as part of their accommodation packages. These include visits to cultural sites, and sailing, paragliding, hiking, kayaking, and underwater diving activities. Albanian Riviera is undoubtedly one of the most beautiful and unspoiled regions in Albania. The Adriatic and Ioanian coast of Albania are of a dramatic beauty. The coastline stretches for over 450 km. The Adriatic coast, about 300 km long has shallow water and long sandy beaches. 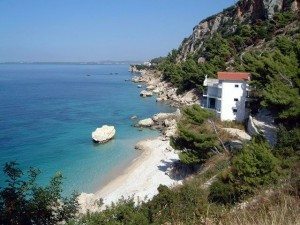 The Ionian coast about 150 km is rugged and dramatic, with steep backdrops to fine white sandy beaches. Clearwater lakes in West Albania and the large and unknown stalactite caves are waiting for their explorers around the world. The Ionian coast about 150 km is rugged and dramatic, with steep backdrops to fine white sandy beaches. These beaches are smaller and rockier. Citrus, fig and olive trees dominate the landscape, giving it a classical Mediterranean beauty. The southern coastline remains unspoilt. 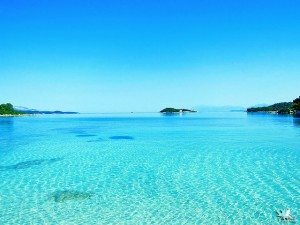 Vlora, Saranda, Dhërmi, Qeparo, Vuno, Himara, Borsh etc., are located where the attraction from the deep, clean, blue Ioanian sea is combined with the clear and healthy air of the mountains. Those places are certainly most attractive locations in Albania, reported as such in all tourist- and guide-books of Albania. The village’s and cities presents a particularly beauty with their characteristic Southern architecture amidst the traditional Mediterranean greenness. The Pirate’s cave by village of Dhermi is an interesting natural cave made famous by the book written by Petro Marko and the movie of the same title. It can be reached both from the sea and the land. The sea view is unique and very particular. Located in perpendicular rocks, in very deep waters it is one of most valuable tourist attraction, that brings you back in the Medieval history of Albania. In 2009, the region gained international attention after the reconstruction of the coastal road SH8, the 2010 tour stop of DJ Tiesto in Dhermi,and the filming of a Top Gear episode featuring a breath-taking car pursuit along the winding coastal road. The area is a major nightlife, ecotourist, and elite retreat destination in Albania. The region features traditional Mediterranean villages, ancient castles, and Orthodox churches. In fact, the landscape alternates between mountain passes, turquoise beaches, underwater fauna, caves, and orange, lemon and olive plantations. As part of the regional master plan, the World Bank and other institutions are financing local infrastructure projects, including the renovation of roofs and facades of traditional houses overlooking the Riviera and the construction of water supply and treatment plants. There are more than 4 million visitors that come to Albania every year and their number is increasing. Situated opposite Corfu (Greece), city of Saranda is now visited by day trippers who come to enjoy this beautifull city . The city of Saranda is the pearl of the Albanian riviera at the Ionian sea. A town with a rich past, a multifaceted present and a promising future. The sea panorama, the variety of flora, favoured by the soft climate, make Saranda the preferred centre for rest and recreation and an important tourist town. Saranda is rapidly developing into the southern gateway for tourism into Albania. Near Saranda stood the ancient Illyrian city of Onchesmos, mentioned as a port in the 1st century B.C. Inside the city walls have been excavated the remains of dwellings, water cisterns and an early Christian Basilica of the 5th and 6th century, containing a beautiful multicolored floor mosaic. 18km south of Saranda are the ancient ruins of Butrint,suprisingly extensive and interesting. Virgil claimed that the Trojans founded Butrint.